114 windchimes and shepherds hooks, monofilament, wire. Temporary installation of 114 windchimes at the Rocky Mountain Land Library for 'Re/Call' event, curated/sponsored by RedLine Denver. Created specifically for this ranch site in Garo, CO. 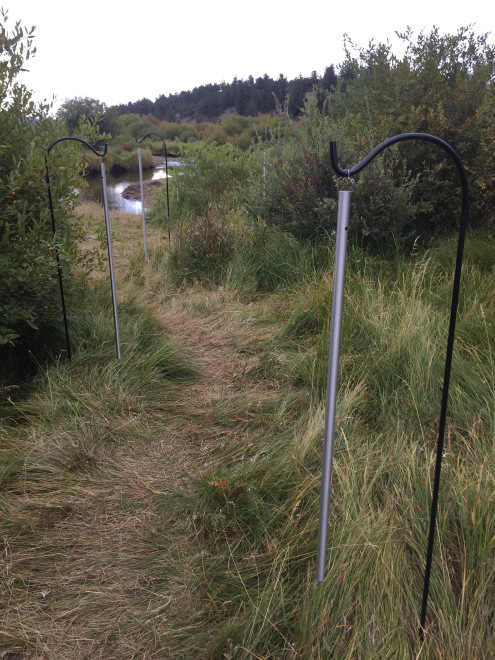 The chimes follow an animal path from the ranch out to a creek on site, getting longer and lower the closer you get to water. A large change happens at the “golden section” when the landscape becomes fertile and the chimes begin to alternate sides and deepen greatly. Offered as a meditative walk and a sound experience for guests. Special thanks to Conor Brown and Andy Lynes for assistance.